Oh, man, I am so behind on laundry but I'm going to post anyway. Sheesh, the price I pay to paint the kitchen. I do not consider myself a perfectionist by any stretch (except maybe when I write), but I do love a good paint job. And I know myself all too well. If I don't get the edges just right - NOW - once I put the paint away, I will forever look at the crooked edges and it will drive me crazy every time I see them. But because it's "so much trouble" I'll just never fix them. Story of my life. Today, in between folding 1000 loads of laundry, I'm taking an artist's brush and fixing the edges along the woodwork, and if I get that done, I'll be painting the blue backsplash behind my stove. Pics to come. To help myself actually finish (the part of any job that is my nemesis), I am holding a "carrot" out to myself: These are Majestic Beauty Indian Hawthorn. Aren't they awesome? They grow 10-12 feet high and 6-8 feet wide, and they have these huge leaves. They grow in a mounded form (my criteria for plants includes NO TRIMMING), although I have seen some growers shape them into small trees. I was so proud of myself - I called around and found them 50% cheaper than retail at a landscape supply company. Yep, I finally broke down and hired someone to help me figure out how to create a screen between my 171-foot-wide front yard and a view of a highway that's hidden only in the summer by a 500-yard field of corn. Yes, I know you people think that Texas ONLY has summer (today's high: 85), but unfortunately, they harvested the corn a month ago. That leaves eight months of the Main Reason We Live Here (ie, generally pleasant Southern weather) with a view I'm not fond of. This probably isn't something I couldn't have figured out on my own - eventually. But because of the enormous scale of it all (this bed alone is 30 feet wide), I couldn't seem to to get my mind around creating even the simplest plan. Hey, I need to reserve my few remaining brain cells for less futile projects, like just digging the holes. So I'm very excited to be able to peck away at this - with a long-term plan in mind. 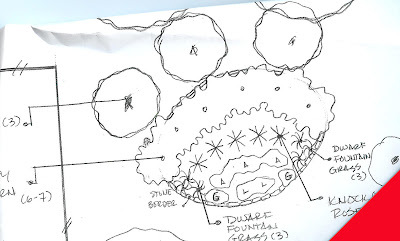 It cost me money to have the plan drawn up, but I think in the long run it will save me in time and money on plants and/or arrangements that don't work. Good luck on the laundry. If it makes you feel better I'm right there with ya! First of all, what a smartie you are. With the "carrots" thing. I need to try that. I'm exactly the same about wanting something to be done perfectly, but if it isn't done correctly the first time never getting back around to it. Unfortunately that causes me to put off a lot of things until I can do them perfectly, and then I just never do them. So good for you for tackling your project! I think that was a great idea to hire someone to draw up the plans for you. Us moms can't do EVERYTHING! I just have the jitters thinking about all that weeding. Have I mentioned that I hate weeding? But I can't wait to see the pix of your painted kitchen!